Esta actividad sobre musicales de Broadway está dirigida a alumnos de últimos cursos de secundaria y bachillerato. Se plantea básicamente como un ejercicio de comprensión escrita mediante algunos musicales muy conocidos que, en algunos casos, están basados en obras literarias y cuya música les resultará familiar. Musical theatre means theatre combining music, songs, spoken dialogue and dance. The emotional content of the piece (humor, love, anger…) as well as the story itself is communicated through the words, music, movement and technical aspects of the entertainment as an integrated whole. Since the early 20th century, musical theatre stage works have generally been called simply "musicals". Broadway theatre, commonly called just Broadway, refers to theatrical performances presented in one of the 40 large professional theatres located in the Theatre District in New York. 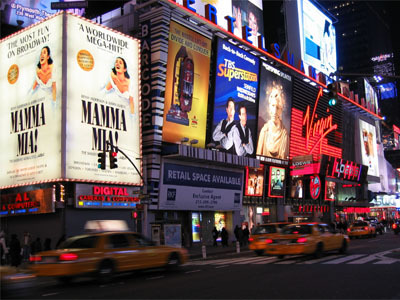 Along with London’s West End, Broadway theatre is usually considered to represent the highest level of commercial theatre in the English speaking world. Based on John Van Druten’s 1951 play I Am a Camera, the musical Cabaret describes the Berlin atmosphere in the late 1920s. The original Broadway production, directed by Harold Prince, opened on November 1966 at the Broadhust Theatre. Cabaret tells the story of an aspiring writer, Cliff Bradshaw, who has travelled to Berlin in search of inspiration. Cliff meets performer Sally Bowles at the Kit Kat Klub. Meanwhile, the Nazi power is growing strongly. A sub-plot involves the romance between German boarding house owner Fräulein Schneider and Herr Schultz, a Jewish fruit vendor. Overseeing the action is the Master of Ceremonies at the Kit Kat Klub which serves as a constant metaphor for the state of Germany. Mamma Mia! is a stage musical written by British playwright Catherine Johnson, based on the songs by ABBA. Although the title of the musical is taken from the group's 1975 chart-topper “Mamma Mia" the plot is fictional. In a Greek island a girl is arranging her wedding with the help of her mother. She will have to find out by herself who her father is when the guests arrive. The musical also includes hits as “Dancing Queen”, “Thank you for the music” and “SOS”. Over 42 million people have now seen the show in Broadway, London and many other countries. A film adaptation, Mamma Mia! The Movie, was released in July 2008. Les Misérables is a musical composed in 1980 by French composer Claude-Michel Schönberg with a French-language libretto by Alain Boublil. The English-language adaptation, with libretto by Herbert Kretzmer, opened at London's Barbican Centre in 1985. It is the world’s longest-running musical, now in its twenty-sixth year, and the third longest-running show in Broadway history. In January 2010 it played its ten-thousandth performance in London's West End. Based on Victor Hugo’s 1862 novel of the same name is set in the early nineteenth century and the plot follows the stories of the characters as they sruggle for redemption, love and revolution. A Chorus Line is a musical about dancers auditioning for spots on a chorus line. The book was authored by James Kirkwood, Jr. And Nicholas Dante, lyrics were written by Edwars Kleban and music was composed by Marvin Hamlisch. With nineteen main characters, it is set on the bare stage of a Broadway theatre during an audition for a musical. The original Broadway production, directed and choreographed by Michael Bennett was a critical hit in 1975, receiving 9 Tony Awards and the 1976 Pulitzer Prize for Drama. The show has enjoyed many successful productions worldwide and was revived on Broadway in 2006. The Phantom of the Opera, the longest running show on Broadway, has become, since its first performance in 1988, a musical phenomenon all over the world. Based on Gaston Leroux’s novel, the story is settled in the famous Opera House in Paris where Christine Daaé, a beautiful soprano, becomes the obsession of a mysterious, disfigured musical genius. The music was composed by Andrew Lloyd Weber and most of the lyrics were written by Charles Hart. Cats is a musical composed by Lord Andrew Lloyd Weber based on Old Possum’s Book of Practical Cats by T.S. Eliot. The musical first opened in the West End in London in 1981 and then on Broadway in 1982. Each time directed by Trevor Nunn and choreographed by Gillian Lynne. It has won numerous awards and the Broadway production has run for eighteen years, setting a record. 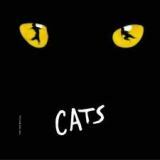 Cats is the second longest-running show in Broadway history. It has been performed around the world many times and has been translated into more than 20 languages. The song Memory has been recorded by a variety of over 150 artists.